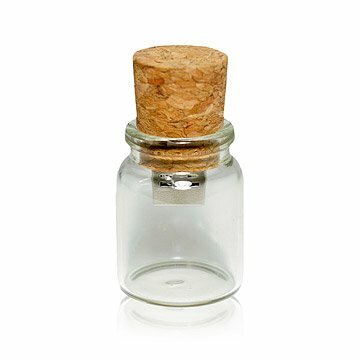 This bottle with a USB drive imbedded in its cork is a charming way to share messages, playlists, and more. Long ago, a castaway might scribble a message on a scrap of paper, seal it in a bottle, and throw it into the sea, trusting time and tide to carry it to its destination. This tiny bottle USB drive lets you capture that bygone romance in our modern, electronic age. It provides a charming way for you to pass notes or share playlists, as well as being an imaginative place to store your important digital documents—keeping your best ideas sealed freshly inside. Made in China. This is a plug and play device, just plug into a computer and wait for it be detected.